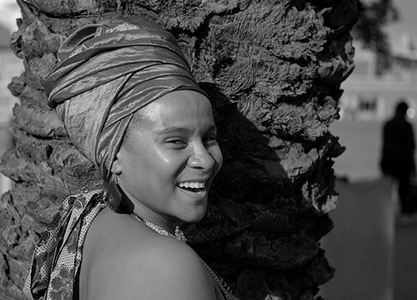 Mashile began to achieve recognition as one of South Africa’s most popular young artists in 2002 when she performed her hip-hop inspired poetry at the Urban Voices Spoken Word and Music Festival to a large audience. She was the presenter and producer of the television programme L’Atitude, a concept that she co-executive produced with Curious Pictures. Throughout its three seasons and seventy-eight episodes she introduced the viewers to the personal stories of a diverse cross section of South Africans and their relationships with their immediate surroundings. These insights were gained from her travels through South Africa. The series reached an audience of over two million households. Her lyrical and gutsy poems in the collection A Ribbon of Rhythm (2005) also speak about life in the new South Africa. Issues such as the diversity and unity of the “Rainbow Nation”, the status of women, violence and the fragility of individuals are all treated with a sense of urgency, humour and at times with melancholy and a certain rawness. Mashile’s self-produced album Lebo Mashile Live! combines her performance poetry with hip-hop, house and R & B. In June of 2008, Mashile published her second anthology entitled Flying Above the Sky. This collection marks the poet’s first foray into self-publishing. In October of 2008, Mashile wrote and performed in a cross-media and cross-generational collaboration with renowned choreographer Sylvia Glasser entitled Threads. One can find Mashile’s thoughts in her monthly column, In Her Shoes, which she writes for True Love magazine. She can currently be seen on South African television screens as the presenter of Drawing the Line, a game show on SABC2 dealing with moral issues. The show is now in its second season. In 2006 she was awarded the prestigious Noma Award for Publishing in Africa, the premier prize for African literature. The Jury characterised her poetry as of “a distinct oral flavour, developing oral poetry and performance beyond the boundaries of the poetry of the era of resistance”. In 2007, she was the recipient of the City Press/ Rapport Woman of Prestige Award. Mashile lives in Johannesburg.